This post is from contributing writer Haley Stewart from Carrots for Michaelmas. Whatever the cause (or causes) may be, food allergies seem to be everywhere these days. If no one in your immediate family suffers from them, you probably know someone who does. When my oldest child was diagnosed with food allergies, it wasn’t the end of the world, but it changed our family’s eating habits, made dining out difficult, and complicated meals with other families. Comparatively speaking, we’ve got it pretty easy. We just have to avoid gluten in order to avoid severe eczema and asthma attacks. But I have friends whose children are allergic to not only gluten, but dairy, soy, nuts, and tomatoes with reactions severe enough to land them in the hospital in order to avoid a tragedy. When talking to other families dealing with food allergies, I often hear….”It’s like our whole lives revolve around what we’ll eat.” It’s tough and what’s worse, it’s isolating. 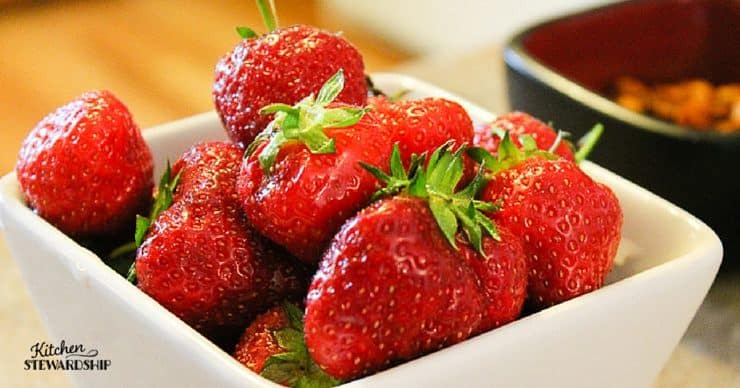 Just think about how intimately human connection is tied to food. We break bread together when we celebrate any special event or milestone. And if you’ve ever been in the situation where everyone around you is eating, but for some reason you cannot join in….it’s a strange sensation. You are with everyone, but somehow looking in from the outside. While we know that the rest of the world doesn’t revolve around our children’s food restrictions (and we’ll talk about how to be helpful and gracious guests in a minute), I cannot express to you how amazing it is to eat a meal that has been prepared with food allergies in mind. To arrive at a birthday party and see that the host made gluten-free cupcakes so that my kids can eat them along with everyone else….it means so much. When we get together with friends for Sunday brunch and they made pancakes out of GF Bisquick and my kids get to devour them, that act of thoughtfulness says to them, “You matter. You’re important.” And their faces light up. In college, one of our housemates suffered from fibromyalgia and her symptoms would flare up after eating certain foods. So if we were eating together as a house, we had to learn to cook in a way that would include her. And you know what? It was inconvenient. She couldn’t have onion or garlic, the typical beginning ingredients to all of our meals. She couldn’t have gluten or dairy. So most of our house meals consisted of various beans and rice and vegetable curries. We learned to make it work, because she was part of our community and it was one simple, practical way of loving her. Don’t be afraid to invite them over. They’re used to dealing with tricky food situations and can advise you. If their allergy is severe enough, bringing their own food may be the only option, but enjoying fellowship at your home will mean a lot. When you invite them over, just ask to be reminded about what their food allergies are. When you come up with your menu, if you’re anxious or unsure that the meal will match up with their food restrictions, just shoot an email with all the ingredients to make sure. They’ll appreciate it, promise. Never assume “a little” won’t hurt. For a severe food allergy, even a little can be devastating or even deadly. I’m not trying to freak you out, just remember that if someone says they are allergic to X ingredient, you have to believe that they know what they’re talking about. Instead of making your brain explode by trying out a bunch of new recipes with substitutions for all of the ingredients they are allergic to, simplify. Make an easy recipe with just a few ingredients that you know are safe. Don’t try to recreate a recipe that involves substituting. Try to stay away from anything out of a box (it’s just difficult to find allergy-friendly anything), but if you do use a processed food, keep the packaging so they can glance at the ingredient list to make sure it’s ok for them to eat. Sometimes ingredient lists can be sneaky and they’ll know what to look for. Don’t stress out. If you realize too late that you used butter in something and your guest is allergic to dairy, all is not lost. They are used to not being able to eat everything on the table, believe me. If there is even one dish they can enjoy, they will be grateful. When you make the effort to cook for someone with food allergies, it’s inconvenient. It is a labor of love and it is SO appreciated. OK, let’s examine the flipside. 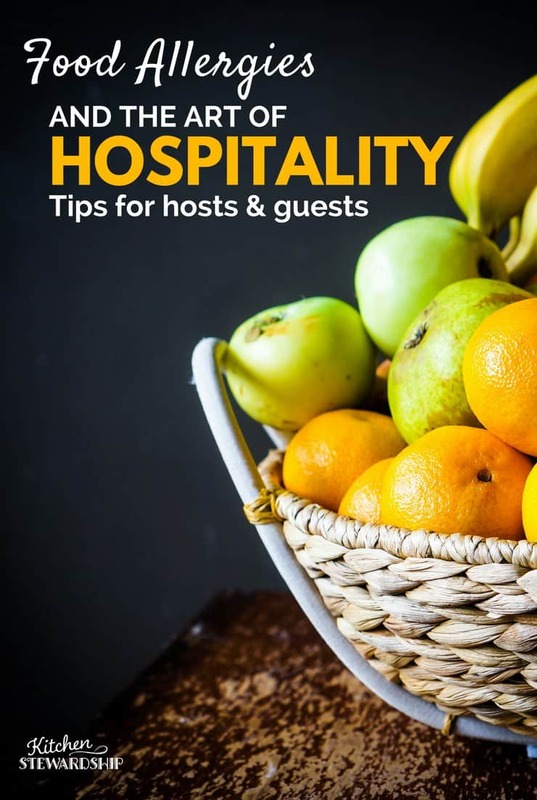 As a guest with food allergies, you should do everything you can to make things easy on your host. They’re making the effort to accommodate you because they care about you, so be helpful and gracious. First and foremost, you HAVE to tell them in advance about the food allergies in your family. They cannot read your mind. Cooking for food allergies is a skill that’s gained over time. It might completely throw your host. And their anxiety or concern about cooking differently might mean that they simply can’t tackle it. That’s okay. It’s not because they don’t care about you, it’s because cooking for allergies is hard (you know that firsthand). As our kids do not have mortally dangerous allergies, we have the luxury of just trusting our hosts that they have avoided the forbidden ingredients. However, if it were a life or death situation, I might navigate things differently and only let them eat food I’ve seen prepared or from friends who are VERY familiar with what they can and cannot eat. Katie here – I have a list of tips to follow when starting a restrictive diet, especially when kids are involved! But no matter the situation, I usually try to bring a side dish that I know my kids will be able to eat (and besides, I’m from the south and that’s just what we do). Be sure to express your appreciation to the host for having you over and cooking for you, despite the difficulty and inconvenience. They will be pleased to know how much their efforts meant to your family. Does your family suffer from food allergies? How do you navigate eating with friends? Great post! My standard line when inviting someone over or taking someone a meal is “Any allergies or preferences I should know about?” It opens the door for the “our kids don’t eat….” or “we can’t have….” And this prevents guests from not being able or willing to eat what I’ve made. I don’t want to take a new mom a meal or have someone here and have them not able to enjoy what I make! I also have a go to, easy, gluten free, dairy free black bean brownie recipe. It makes it easy to have one recipe that I can whip out for my gluten free friends and seriously, who doesn’t love brownies? If they can have dairy they are great with ice cream and I can use butter instead of coconut oil. And for my son’s huge birthday party I made our traditional chocolate cake and then had those too so everyone could have something chocolate to enjoy, but we still had our tradition. Being a welcoming host isn’t hard, especially if you stay with whole foods, keep the meal simple and just communicate with your guests. Great ideas in here! Thanks so much, Heather! I love those tips. Thanks so much, Heather! And I love those tips! Great article. Our family has many allergies and it is indeed isolating. All of our friends know about our allergies and feel overwhelmed with the idea of cooking gluten, dairy, legume and nut free. Sadly we never get invited to anyone’s home anymore. 🙁 We host parties regularly in order to get together with friends. (On a plus side this has made me a better hostess.) My one bit to add would be if you have allergy prone friends invite them over with the invitation that they could bring their own food. I have tried hinting to my friends that we would be completely open to this but yet it never happens. Getting together does not have to be about the food! I have two children that can not have dairy, grain, beans, or any preservatives, artificial food coloring, etc. It is very hard to go anywhere! I am blessed with a few friends that understand are so gracious about having things my children can eat. Mainly, we just bring our own. Sometimes it is very hard, but we have learned to roll with the punches. Though it is much easier to have people come to our house! This is great advice, in both directions! For me, hosting guests at home is relatively rare, but I often bring and/or coordinate food for church events. It’s become second nature to me to label things that contain nuts (as well as things that look like they might have nuts but don’t!) as we have two nut-allergic parishioners. I also label things that are vegetarian or vegan because some people voluntarily follow special diets and others fast from animal foods during Lent. My immediate family has no food allergies. However, I’m allergic to dogs and get very frustrated that people can’t seem to remember that! I need to work on taking a proactive approach like yours, asking about the dog every time I’m going to a house where there is one so that my hosts can plan to keep the dog and its dander away from me, or me away from it. P.S. Katie, I really like the new site design! Very pretty and much less cluttered. I love dogs but I can totally imagine how difficult that is!! One of my husband’s coworkers has been bringing his puppy to the office and my first thought was “what if someone had a serious allergy? !” Love your idea about labeling! One thing I do wish is that hosts would simply accept — I’ll bring their foods. They always press and press for what to feed my kids. Now they have some more foods they can eat than they used to be able to do (most fresh produce) but for awhile I was literally able to only feed them produce from certain farms, specific brands of butter, salt, etc. It was really not feasible for them to have anything for them but people have such a hard time accepting that — maybe because we live in the south. I am *only* gluten free and don’t have life threatening reactions, just severe stomach issues and migraines, but have been pressed many times into eating this or that because they thought it should be safe and I paid for it with my next week. It’s actually harder for me to say no for myself than for my kids. I don’t know. Sorry this is mostly just ramblings on the difficulty levels. After having very sensitive allergies in our house (small cross contamination made them sick) I actually am more scared to prepare for others with allergies than I would have been before – also much more careful! I recently was diagnosed with sensitivity to gluten, diary, and sugar and am waiting for the results for a bunch more tests. They’re not going to kill me but they cause inflammation (which contributes to endometriosis and miscarriage). I was told to avoid completely, that even a little can cause enough inflammation to contribute to my reproductive problems, but I can tell friends and family just think I’m being “picky” or overly health conscious or giving in to fads. I’d rather just pass up a dinner invitation all together and avoid traveling to visit family than seem like I’m overly critical or intentionally causing stress to my hosts. But on the other hand, I will bend over backwards (and not mind – really!) to serve food that guests with allergies, sensitivies, or lifestyle preferences can eat. We really don’t eat with others. We keep intending on inviting lots of different people over to our home, but never seem to get around to it. I can’t have peanut or tree nuts both my husband and I avoid dairy. And those are easy enough to work around But then I have a list of other intolerances (apples, corn, lettuce and strawberries) that tend to throw people for a loop. My favorite allergy friendly meal is crock-pot chicken tortilla soup. The soup is easy plus people can add toppings depending on their preference. When hosting I often do a taco bar for the same reason. You can offer corn and flour tortillas, meat, beans, lots of toppings. Those grain free can just do a taco salad, the vegetarians avoid the meat, the gluten free have corn tortillas, etc. Everyone picks what works for them and yet there is fellowship in sharing a meal! Baked potato bars are amazing as well! My husband was really skeptical of serving that as a main course, but it was a huge hit at his birthday party. Lots of topping options and a few salads (black bean and corn, fruit, etc) made everyone really happy! great idea Heather! I will try it for my next party :). Those are two of our go-to meals for company, as well. Kids always like either taco or potato bar, in my experience. I love ALL the ideas on this thread! Haley, thank you for writing this! As someone who has food allergies and a housemate with food allergies, this is really relevant to my life. 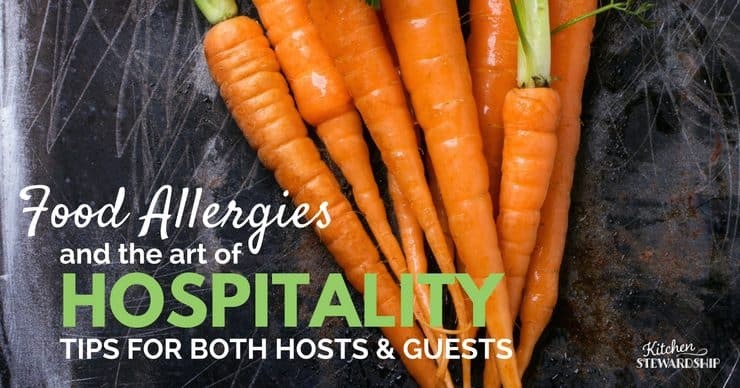 I really appreciated your suggestions on both how to host those with food allergies and how to be a good guest with food allergies. I’m so glad it was helpful, Cecilia! –First, when I’m inviting people over for the first time, I always ask, “Any allergies or other food issues I should know about before cooking?”–and then I’ll work my menu around them. I have friends who are vegetarian, others who can’t have gluten, still others who can’t eat anything in the mint family (yep, that includes oregano and basil)–you get the idea. That way I don’t have a last-minute emergency, and I also don’t find myself getting annoyed that I worked hard to prepare a meal that people can’t eat. I’m mostly replying because I’m amused. My husband is allergic to chicken. I’ve become a much better cook trying to cook around his allergies (none of which are life-threatening! ), but I still don’t know how to cook chicken! I also have a friend who is deathly allergic to sweet potatoes! You just never know! Both my kiddos had IgE food allergies and the inability to digest certain proteins and sugars in foods. As they’ve gotten older things have improved. My son was on a prescription amino acid based formula for his first 2 years because he could not digest any food protein. With one member of our family eating no food, how to shift the focus of celebrations off of food. I will never forget the first Christmas with my family after my daughter was diagnosed with food allergies (egg, milk, soy, peanut, treenuts, wheat and avocado). We asked that there be no nuts served while we were there and my mom said, “But it’s not Christmas without nuts!” That was 4 years ago and over all my family has been amazing, but that comment and a few other situations still sting a little. As a parent, always always always bring enough food for the family member with allergies. Even with careful planning and advanced menus mix-ups happen (especially when it comes to dessert). Having aback up meal allows everyone to enjoy the gathering even if they can’t all share the same food. Well put! I am severely, severely allergic to fish. Considering that I live at highish elevation in the middle of the plains, you would THINK it’s easy to avoid, but cross-contamination on grills, marinade brushes, and fryers is a real issue, along with worchestershire sauce, caesar dressing, etc. I can’t even be NEAR it; even visiting rivers/ocean/aquarium is out for me. Last year, I reminded my boss before our company dinner. I even offered to bow out so that they wouldn’t have to worry about it. Oh, no, we want you there. They booked a steakhouse that tends to cross-contaminate everything, so all I ever get there is meat-free soup and salad. Then the time came to order, and three people out of eight, including my boss, ordered salmon. So. Awkward. I hate it. I’m sensitive to gluten and dairy so I avoid those two ingredients in addition to limiting my grains. I’ve found parties are usually harder to navigate than dinner with a small group of friends. People usually don’t have a main entree at a party so everything seems to have a ton of cheese or is made out of bread. Not to mention the cake! I leave most parties hungry. We just had a huge Super Bowl/birthday party and all but one of the items was gluten free. I’m not going to spend hours cooking for 50 people and not be able to eat at my own party! And it really wasn’t that hard. I just couldn’t fix a bunch of processed junk. I did joke to the one other person there who is newly gluten free that this would be the one and only time he’d be able to eat the cake at a party. I hope that having mostly gluten/dairy free items at a party can show people is that it can be good. People who don’t have dietary restrictions generally assume anything different than the traditional American diet will be tasteless and gross. Maybe this is more awkward, but I’m getting married this summer, and in the spirit of my smallish casual wedding I’m planning to have a potluck reception. However my kids and I are both dairy and gluten free. How do ask people to bring a dish that we can eat without seeming rude? Alissa, just one thought, be really cautious about what you eat the day of your reception. My sister and dad who are both gf accidently ate gluten the day of my brother’s wedding reception (we later learned the food was cross contaminated when prepared) and were really sick for the rest of the day. They missed all of the festivities. It would be really sad to be sick the day of your own wedding reception. Alissa, I think only asking people to bring gf/df will come off as rude, or maybe overwhelming is a better word, to some people. Depending on how sick you get I would not eat just anyone’s idea of gf anyways (I certainly don’t personally) – others have no idea how it’s hidden in sauces and that oats need to be gf, just to name a few things that have been offered me as gf. Anyways, I think a better option would be to simply say we’ d love if you can bring gf/df dishes since we have to eat this way but if you don’t please label your dish as containing gf/df, or something like that. It nicely encourages it and also helps you know which are okay and which are not. Just so you know, traditional Rice Krispies are not gluten free! They have malt, which is made with barley. 🙁 They do have a GF version now though, apparently.